This is Dakota. Dakota passed away earlier this year, but since she has always been the official mascot of The TBR Dare I decided to include her in this the final dare. She’s pictured here just after eating In Cold Blood by Truman Capote. Yes, it was a library book, and no, she was not sorry about it. It was a tasty book. Are you brave enough for one final round? I’ve been wavering about it for several weeks now but I’ve decided to go ahead and release the Kracken! So if you’ve taken the dare every year for years, or never taken the dare before, this will be your last chance before I retire The TBR Dare for good. The TBR Triple Dog Dare works like this…. For the first three months of 2016 read only the books that were already in your TBR stack as of midnight December 31, 2015. You can modify The TBR Dare any way you need to: include books you’ve ordered but not received yet as well as books you have already placed on reserve at your local library; make exceptions for certain books that will be published early next year; allow book club choices and ARCS as needed. The TBR Dare has always been about having fun, so make whatever changes to the “rules” you need to to keep it fun. To keep everyone honest, I only ask that you publish your exceptions in your sign-up comment or on your blog. If you just want to take The TBR Dare for a month, that’s fine, too. The TBR Triple Dog Dare will run from January 1, 2015 to April 1, 2005. Technically, it’s not a shopping ban so you can still buy books–you just can’t read them until April 1. Most people find it’s very enlightening to finally read the books they’ve had on the TBR shelf all these years. To sign up, click on over to the official TBR Triple Dog Dare page, which looks a lot like this one, and leave a comment. Or just sign up in a comment below. I’ll add you to the list of who’s in as quickly as I can. Be sure to check back here from time to time. I’ll be posting updates throughout The TBR Triple Dog Dare to see how everyone is doing. 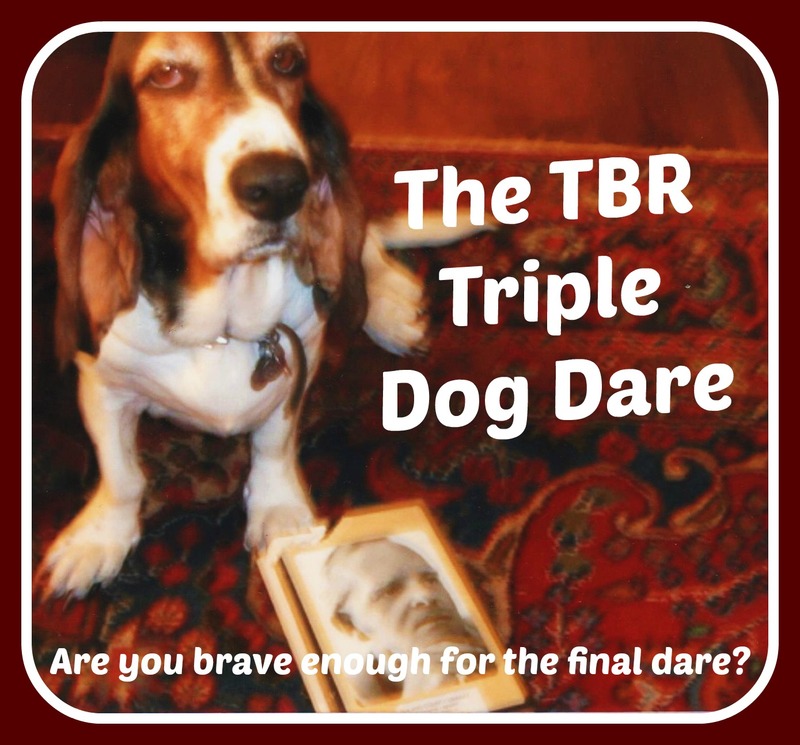 Remember, The TBR Triple Dog Dare is not a “reading challenge”; it’s a dare. So if you’re someone who does not sign up for reading challenges you can still participate. Nice to see Dakota again!!! That’s C.J.’s favorite picture of her. We both still miss her. It’s funny just how far a dog can work its way into your heart. I wasn’t super-good with this last year, but am planning to try again this year – with the exception of books sent for reviewing. It’s the library books that tip the balance for me, though! I do know what you mean. Last year I spent part of New Year’s Eve putting books on reserve. I fully intend to take part, and will stick to it for the full three months. Not sure if I’ll be able to do the book buying embargo like last year but you never know! Glad to have you on board this time around. There is no book buying ban associated with The TBR Triple Dog Dare, but why tempt yourself. Also, I’m in. Even when I haven’t totally lasted until April, I’ve still made some progress each year. So I’ll try for the whole three months. Glad to have you aboard, Amy. I’m not sure if it’s ok for me to take part given that I do this all year round, but I’d like to! I always consider you honorary grand marshal. I am in until 1 April. Will put a post up on my blog later in the year. Only exception is my book club books but that amounts to 3 books. Looking forward to getting through more of my home owned books. I am doing this in memory of Dakota. Dakota gives you a big wag in spirit. When Dakota wagged, she really wagged. Yikes, I can’t resist! Count me in. So glad you are doing this one more time! I don’t blog, but every year I use your dare to motivate myself to stick to reading from my own shelves. I am in, but I’m going to try a goal this year: 3 months or 35 books, whichever comes first. And I’m claiming my usual exemptions for a couple of long-awaited new books. Thanks for hosting another round! I will be joining in and will write up a post…soonish. I am also going to aim at a buying embargo at the same time period. I love my new kitty (2 and 1/2 years now) but I do still miss our previous cat, a resident for 13 years. I end up not buying books for January and most of February, too. I’ll take that as a yes to my last comment! I actually did this for two months last year and greatly enjoyed actually achieving things. I decided last year that I should start this in December though, and not wait until January. My summer holidays (NZ) start then and I can get through to February-March (probably). I’ll probably set up an alternative blog to do this as I am “on a break”. Glad to have you in and starting early. How can I resist one last dare? I’m in and will post about it next week. You’re welcome, Quinn. It really does take this little dare to force me to really look at what I already own. I’ve a good library, too. A most timely dare, which I’m willing to accept. Glad that you stipulated we can read what we’ve already ordered, as I’m anticipating the Little Black Classic Set that Penguin published for its 80th birthday. That alone should take me through August! Thanks for hosting, James. Fortunately, for my bank balance, I have not seen the Black Classic Set yet. Welcome to the dare. I’m in! I do have a short stack of library books on my dresser, but will try to read those before Jan 1st. I’ll be sad if it’s really the very last Dare…. By the way, is there an actual sign-up list/page? it wasn’t clear where to click- the pic of Dakota (lovely!) takes me to your profile?? You’ve just signed up!!! I did set up a page (see top bar) but I’ll check on fixing that picture’s link, too. I really SHOULD try it, as I should do something before books take over my room. I will allow the local library, though, as I have joined a reading program there (“With book into spring”) and as my main problem are the English language books, there are lots less of them available here. But, if something has to take over your room, why not books? Welcome to The Dare. My main goal the beginning of the year is to focus on my ARC’s that I already have in my Kindle. Many do not have publishing dates until after the New Year–would those count since I have copies already? Or not because they aren’t officially published yet? I also, of course, want to work on some of my TBR books that I was either gifted or purchased. If you have it or have ordered it before midnight Dec. 31, then it officially counts. I wonder if you can do the entire TBR Dare with only ARC’s. Is it terribly sad if I can say, yes, I probably could? Welcome back. Dakota will always be linked to The Dare for me.